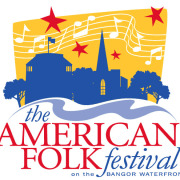 The American Folk Festival on the beautiful Bangor Waterfront offers multiple volunteer opportunities; including festival administrative opportunities prior to the event, pre festival on-site setup, three days, multiple shifts during festival weekend and site tear down following the close of the festival Sunday night and Monday. All shifts range from 2.5 hours to 4 hours, depending on the area you choose. You are welcome to volunteer in more than one area and/or as part of a group/team. The more the merrier!! All volunteers receive a custom design volunteer tee-shirt that must be worn during your volunteer time(s) and is yours to keep. Nite owls are encouraged to apply as performers are on stage well into the evening, ending at 10pm Friday and Saturday nights. Junior volunteers are also encouraged to participate however anyone under the age of 18 will need a guardian's signature to participate, and our volunteer friends under the age of 16 also require a guardian to volunteer with them. This is a great opportunity for families to begin a volunteer tradition!